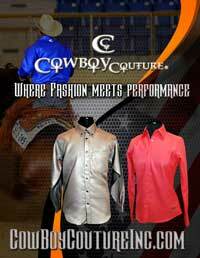 The 2013 NRHA Futurity has come to a close but it was certainly an exciting ride! Brian qualified two entries for the Level 4 Open finals after two good runs on each horse in the go-rounds. He was the second highest composite rider in the Level 3 Open aboard Footwork Revolution (pictured above) with a 221.5 in the 1st go and a 223 in the 2nd go. Aboard Memorable Affair, owned by Wagner & Vandorp, he had a composite score of 438. Although the finals didn’t go as well he had hoped, Brian was pleased with the performance of his horses all the same. Memorable Revolution placed 18th in the Level 3 finals and 25th in the Level 4 finals bringing home a check for $17,755 and Footwork Revolution placed 19th in the Level 3 finals and 26th in the Level 4 finals taking home $16,916.78. What a great way to close out an incredible show season!